NYC Recession Diary: Bubble Battle NYC: Free...bubbles? Millions of bubbles fly through the air as we converge in Times Sqauare for a magical bubble battle! Loosely based on the Dr. Seuss Classic The Butter Battle Book. Bring bubble toys, bubble generators, bubble solution, and plenty of AA batteries. 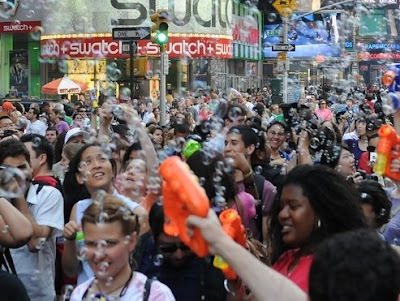 Meet in Times Square, fill your weapons and pull the trigger!Last year over 1,500 people came to take over Times Square and disseminate joy by the bubbles per minute. Be creative with your contraptions and take sides: butter side up or butter side down! Friday, June 12th 2009 @ 6:15pm Rain or shine.